Once you have added Virto SharePoint Alerts and Reminders to the site page, you have to adjust add-in. Use “My alerts” and “All alerts” tabs to display and manage created alerts. An administrator can select Time Zone for this app. 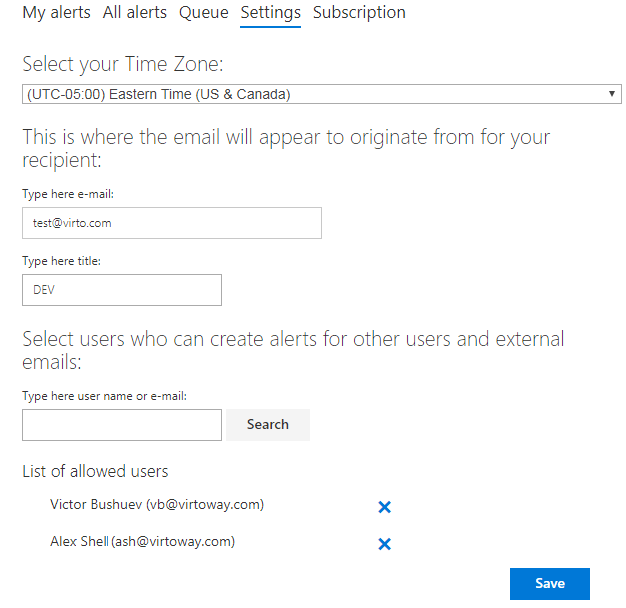 This feature is especially useful if you create alerts, involving recipients from other time zones. Next option allows you to define email and user, which will be shown in recipient's email as sender email and title. A user with administrator permission is able to set list of users who can create alerts.